Thanks to overwhelming interest, this webinar series has been expanded to 8 weeks! Learn how you can defend old-growth forests in a fun and interactive info series! That’s why Sierra Club BC is offering a live weekly webinar course on the state of old-growth forests on Vancouver Island, forest policy in BC, and what you can do to step up pressure on the decision-makers allowing this short-sighted destruction to continue. Join Sierra Club BC forest campaigners and experts in the fields of forestry and conservation. This eight-part webinar series will be offered on Thursdays from 12:00 pm to 1:00 pm PST, April 11-May 30. Webinar recordings will be made available to webinar series registrants. This series is offered free of charge; however, we invite you to make a suggested $15 donation to help cover the cost of your participation. Once you click ‘Register Now,’ you’ll be redirected to a page where you can make a tax-deductible gift of any amount. Space is limited. RSVP below and we’ll follow up with details on speakers, topics and how to connect in to the webinars. Jens is Sierra Club BC’s Senior Forest and Climate Campaigner, working to protect BC’s spectacular rainforest and fighting global warming. 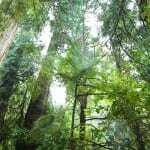 He has been with Sierra Club BC for more than 12 years and during that time has written extensively on solutions to maintain the ecological integrity and the climate-stabilizing role of Old Growth Forests in the Pacific Northwest. Eli is a Nuu-chah-nulth Canadian political scientist who has focused in Constitutional Law, International Dispute Resolution and Ecological Governance. Co-founder of the Ha’uukmin Tribal Park in Clayoquot Sound on the west coast of Vancouver Island. Eli is the lead organizer for the Meares Island Tribal Park 35th Anniversary Victoria Celebration on April 17th. Hannah is Sierra Club BC’s Executive Director. Hannah is a lawyer and practiced public interest environmental law before joining Sierra Club BC. She also researched Tsilhqot’in and Ktunaxa law as part of the RELAW project (“Revitalizing Indigenous Law for Land, Air and Water”). Andy, whose graduate research was in mycology, is a forest ecologist and the co-author of six guidebooks to BC plants. He recently retired from a 30-year career as an ecologist with the Research Branch of the BC Ministry of Forests, Lands and Natural Resources. Guy Dauncey is an eco-futurist who works to develop a positive vision of a sustainable future, and to translate that vision into action. He is founder of the BC Sustainable Energy Association, co-founder of the Victoria Car Share Co-operative and author or co-author of nine books, including ’The Climate Challenge: 101 Solutions to Global Warming’. Valerie is the Fibre Solutions Specialist at Canopy. Valerie has been engaged in forest conservation campaigns for over twenty years, working as the Forest Campaigner for Friends of Clayoquot Sound from 1988 to 2004 and taking part in the collaborative process that developed Ecosystem-Based Management in the Great Bear Rainforest. Today, Valerie is focused on accelerating Next Generation solutions, which includes use of agricultural residues, such as wheat straw, to make commercial paper and use of recycled clothing to make new rayon, as an alternative to using primary forests for pulp and paper and textiles. Kekinusuqs, Dr. Judith Sayers is a member of the Hupacasath First Nation and mother of two. She is the President of the Nuu-chah-nulth Tribal Council, Strategic Advisor with Sayers Strategic Advice; and former Chief of Hupacasath First Nation. Mark is a multidisciplinary activist, naturalist and journalist who has an affinity for the wilder landscapes of British Columbia. He has developed his storytelling voice through four years of print-media at the University of Victoria’s Martlet Independent student newspaper as well as freelance journalism while completing his undergraduate degree in Political Science & Environmental Studies. Caitlyn has worked with Sierra Club BC since 2007 to promote climate solutions and green jobs, keep fossil fuels in the ground, and protect BC’s wild places. Her work has included supporting community-based First Nations’ monitoring initiatives, protecting endangered coastal rainforest, inspiring climate action, and keeping the BC coast free from tar sands pipelines and tankers.